Are you moving to Atlanta? Let the Atlanta area’s premier moving company help make it a worry-free experience. Bulldog Movers has been providing professional moving services since 1982, and the expertise of our movers has helped us to not only become one of the area’s largest moving companies, but also one of its most highly regarded. We have a staff of more than 100 full-time, highly trained movers, manning a fleet of nearly 30 of our signature red trucks, so we are able to handle residential and commercial moves of any size and scope. Our moving company has an outstanding track record for complete customer satisfaction that has helped us to earn a ProMover designation from the American Moving & Storage Association, an A+ rating from the Better Business Bureau, and the honor of being the only Atlanta movers to have earned the Consumers’ Choice Award for nearly a decade straight. 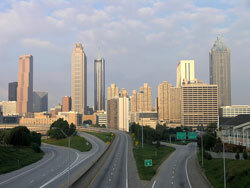 For more on how we can make moving to Atlanta easy, contact Bulldog today.